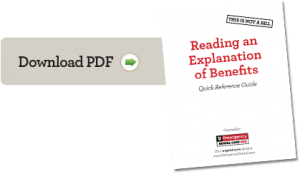 An Explanation of Benefits (EOB) is NOT a bill. It is a summary sent by a health insurance company every time a patient receives treatment from a medical professional. It outlines the dates and types of treatment received, and the costs the insurance company will pay. Company information: Name, address and phone number of the insurance company. Make sure this is current. Provider information: The dentist, physician or other medical professional who treated you. This may be combined with the Patient Information or listed separately. 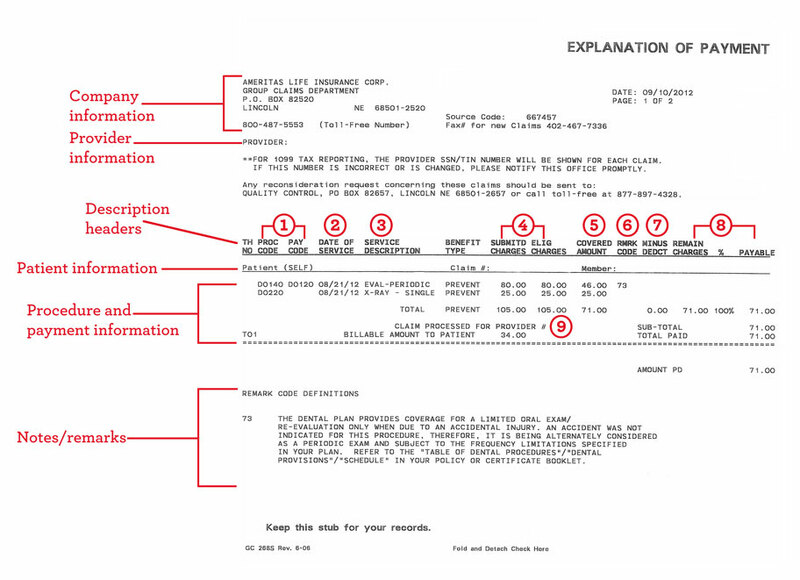 Description headers: These columns outline the dates and types of medical services, and what the insurance company is paying. Patient information: The person who received treatment. This may be combined with the Provider Information or listed separately. Procedure and payment information: Details about the exact procedures and tests that were performed, and payment information for each of them. 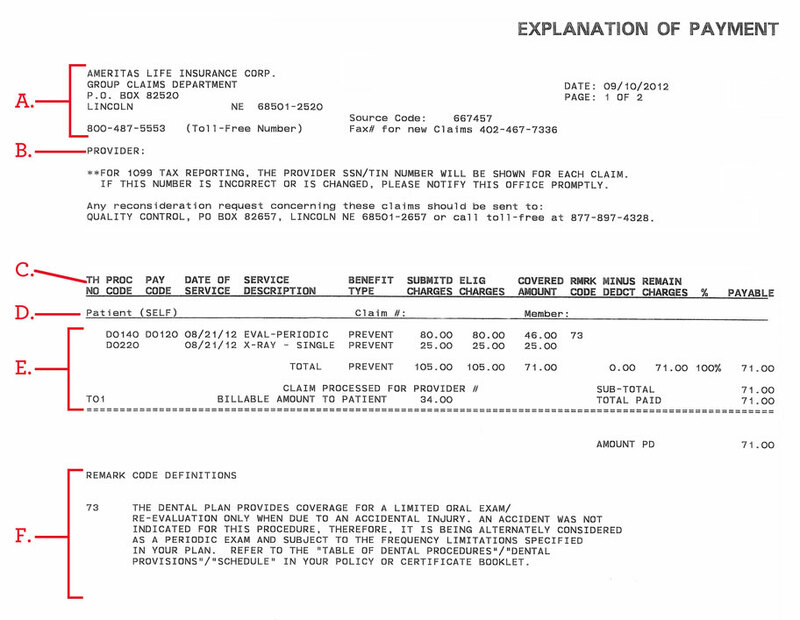 Notes/remarks: These explain the insurance company’s reasons for paying or denying the claim, and the amounts paid. Procedure Code and Pay Code: Some insurance companies provide only these codes and no description of service. Make sure these match the codes on the bill from the provider. Date of service: The date of your appointment, test or other medical service from this provider. Service description: A brief summary of the treatment you received. Some EOBs don’t have this. Submitted Charges and Eligible Charges: Submitted Charges is the fee the provider normally charges for the service, and has submitted to the insurance company. Eligible Charges is the part of the fee that the insurance company will consider paying. Sometimes, a provider’s fee is higher than the “reasonable and customary” fee that an insurance company would approve. Covered Amount: This is the final amount the insurance company will review for payment, as determined by your insurance policy. 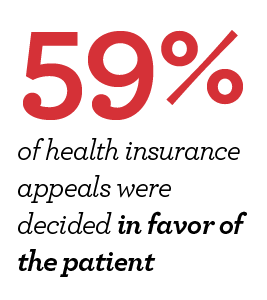 Remark Code: These numbers and letters refer to comments in the Notes/Remarks section. Minus Deduct: This means “Minus Your Deductible.” If you have a deductible that must be paid, it will be stated here. Remain Charges: The “remaining charges,” or final fee the insurance company will cover. %: The percentage of that fee the insurance company will cover. Payable: The amount the insurance company will pay the provider of the service, in dollars. Billable Amount to Patient: This is the amount you’ll need to pay because it’s not covered by insurance. The provider will send you a final bill for this amount. Be sure this amount matches the amount on the bill when you receive it. 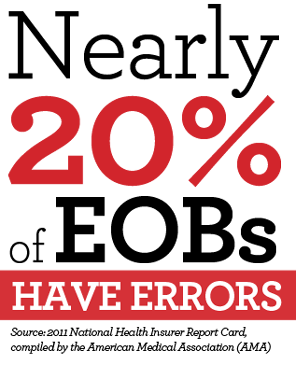 An average of 19.3% of EOBs have errors, according to the 2011 National Health Insurer Report Card, compiled by the American Medical Association (AMA). So it’s possible there may be an error. Least accurate: Anthem Blue Cross Blue Shield. Accuracy rating: 61.05%. The AMA estimates that these inaccurate claim payments will cost the healthcare industry $17 billion in needless administrative expenses this year alone. The AMA also found that physicians received no payment at all from commercial health insurers on nearly 23% of claims they submitted. Double billing: Being charged twice for the same services, drugs, or supplies. Typos: Incorrect billing codes or dollar amounts. Canceled work: Charging for a test your doctor ordered, then canceled. Phantom services: Being charged for services, test or treatments that were never received. Up-coding: Inflated charges for medications and supplies. Incorrect length of stay: Most hospitals will charge for the admission day, but not for day of discharge. Be sure you’re not paying for both. Incorrect room charges: Being charged for a private room, even if you stayed in a semi-private room. Inflated operating room fees: Being billed for more time than was actually used. Payment refused? Don’t be afraid to appeal! 59% of health insurance appeals were decided in favor of the patient. 40% of external appeals that were reviewed by a third party were reversed in the patient’s favor. Source: 2011 Government Accountability Office (GAO) survey. Need help getting through all that paperwork? If you don’t have the time or are too sick to inspect your medical bills for errors, you can hire an expert to check them for you.